RB Rail, the Baltic states' joint company implementing the European gauge railway project, Rail Baltica, has invited Polish companies to jointly organize public tenders, informs LETA. RB Rail CEO Baiba Rubesa did not reveal what tenders the company has in mind but added that the Polish side had been acquainted with the idea a year ago. "The one very interesting opportunity that exists, on which we will start working in the fourth quarter of this year or next year, is how to do common procurements. Many of you know that consolidated procurements are already expected between all three Baltic countries for superstructures and superstructure components", Rubesa told a TEN-T conference in Ljubljana on Thursday. The Polish side's joining would be economically beneficial, she said. "The question is how we can invite our Polish colleagues potentially to be part of that as well because it will bring efficiency, economy and great affectivity but this is a long dialogue", Rubesa said. Asked by BNS Lithuania to specify what tenders she had in mind, Rubesa said it was too soon to elaborate, adding that the Polish side was introduced to the idea of joint public procurement a year ago. "We already put forward to the Polish stakeholders a year ago that there is a possibility to do procurements together", Rubesa said. She also refused to comment on whether discussions with Poland had already been started. "I am not going to comment. It is not your business. We are in dialogue with Polish entities, that is all I am going to say", she said. Rubesa also refrained to comment on whether she would seek a second term as RB Rail CEO. RB Rail announced in March that over 70 procurements are planned to be announced this year as part of the Rail Baltica project. 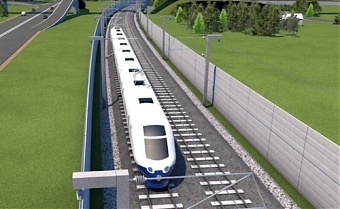 As part of the Rail Baltica project of preliminary value of 5.8 billion euros, a direct railway connection between the three Baltic states and the European railway network will be built. Passenger trains will be able to reach speeds of 240 km/h on the line, while freight trains will travel at up to 120 km/h. The project should be completed by 2026.